We are looking forward to our seventh volume of The Wall Series at PAUL Studios Berlin! This bi-monthly performance series gives artists an opportunity to present their works in progress or finished works in an intimate setting for an enthusiastic audience. For Vol. 7, we are looking for artists who would like to present their work on Friday, May 17th 2019 AND Saturday, May 18th. We are open to performers of all disciplines interested in sharing their pieces in an intimate venue. All performers will receive 5 hours of free rehearsal time at PAUL Studios Berlin prior to the performance. *Note: As we are a self-funded/artist-run collective, we do not have funds to cover travel or boarding costs for performers. Thank you for understanding. We look forward to seeing/hearing/reading your submissions! JOIN US ON FRIDAY, MARCH 15TH, & SATURDAY, MARCH 16TH FOR THE WALL SERIES VOL. 6! FOR MORE INFORMATION ON THIS VOLUMES PERFORMANCES CLICK HERE. TO RESERVE TICKETS CLICK HERE. JOIN US! FOR MORE INFORMATION ON THE SESSION CLICK HERE. We are looking forward to our sixth volume of The Wall Series at PAUL Studios Berlin! This bi-monthly performance series gives artists an opportunity to present their works in progress or finished works in an intimate setting for an enthusiastic audience. For Vol. 6, we are looking for artists who would like to present their work on Friday, March 15th 2019 AND Saturday, March 16th. We are open to performers of all disciplines interested in sharing their pieces in an intimate venue. All performers will receive 5 hours of free rehearsal time at PAUL Studios Berlin prior to the performance. Once again we were overwhelmed and overjoyed with the amount of talented artists who sent us applications to perform at PAUL. In our fifth edition we are proud to present the works of five outstanding artists. This bi-monthly performance series invites performers of all disciplines and in all stages of their work to perform amidst our new WALL. We are so lucky to have these artists in our presence. Don't miss this inspiring evening! Donations: 8-10euro (Sliding Scale) at the door - Please reserve a spot beforehand by clicking the button below! *TICKETS*: Due to large turnout we ask you to kindly reserve a spot by clicking on our EVENTBRITE link below. This way we won't sell out, and know how many guests to expect. THANK YOU! Throughout the research process I have been trying to answer three big questions of life. Where humans originate? What are we made of? How do we progress? The aim of my research is to create different images in relations to these questions. He was born in Hungary where his interest in dance started at the Budapest Contemporary Dance Academy. He gained his first experience in performing at Trafo and Mu Theatre in Budapest. Attila continued his studies at the Salzburg Experimental Academy of Dance (SEAD) where he gained professional experience at different festivals. (New Face Dance Festival in Salzburg, Symphonic Dance Festival, Tanz House Festival and To Spring Tanz Festival in Salzburg) During his time he worked with Alleyene Dance Company (UK), Eduardo Torroja (ESP), Jelka MIllic (SL), Elton Petri (GR), Rakes Sukes (IND) after he finished his study He was collaborating with Lior Lazarof (ISR), HZT Academy, Berlin with Anna Németh (HU) and The Ryder Project Gallery in London with Andrea Canepa (CO). Currently living and working in London, Attila has started the creation of his own work as well as delivering CHANGE, FORMATION, TRANSFORMATION movement research workshops in London, Budapest and Berlin. 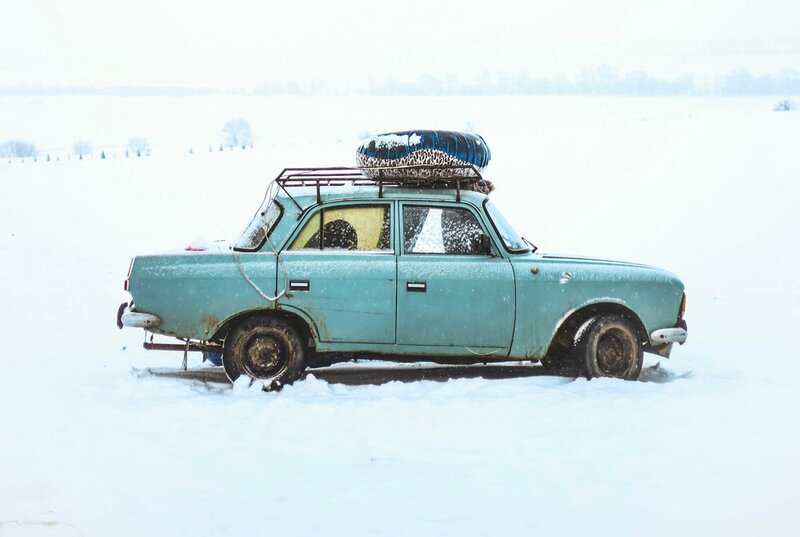 He is looking for movers to collaborate and explore his work and ideas all around Europe. String Theory is a research performance based on empathy and teamwork. Five audience members will tie an access to point to the performer and influence, or just listen, to what follows. String Theory provides anonymous responsibility to the on-looker and valuable information to the stage. This piece provides creative influence for and by the audience as well as tangible responsibility for all parties involved. What will we learn, where will we go, and who will we see on this corporeal kite ride together? Sabina Moe is a choreographer//performer from the U.S. She makes work for the purpose of joy and empathy. She has lots of friends. She has make lots of work. She has lots of work still to be done. Hi Mom. “The move” is a piece about all, more or less, movements we do in order to do a single movement. It is about a kinetic research of a dancer’s usual movements, which does without even think. It is about an effort to be more considerate about how a dancer moves all the time. A constant battle of mind and body in order to do the right movements, with the proper quality and to keep the balance concerning the choreography, the dramaturg and the perfect timing. So the idea is to do and speak loud to myself of what to do and the audience is experiencing live my thoughts and my interpretation. This piece is an improvisation solo, concerning my kinetic patterns and has a goal to break through my habits in movement. Nadi Gogoulou is a professional dancer/performer. She graduated a professional dance school in 2011 and she has a degree in Economics from 2013. She mostly works as a dancer with many Greek choreographers in dance performances and site specific performances, but also as a creator of her own choreographies. Works of her own is the pieces “DownFall”, “On the spot”, “Late Night Impro”. In addition to that she directs her own short dance films and some of them had been presented in the Athens Video Dance Project, Moving Images International Video Dance Festival and International Dance Film Festival, in Greece, Cyprus and Belgium respectfully. She works also in theater productions as a director of the movement and occasionally she gives contemporary dance classes to amateurs and actors. How an ashamed body moves when it is forced into action. Revealed when it is not ready to be visible. Needing to disappear. What we shame or celebrate is about what ideas we have of right or wrong. A critical perspective on feelings, power structures & space. But there is a fantasy of freedom — depowering oppressive structures, unlearning and unbecoming what is constituted. Freedom from having to be or do, from expectations, discipline and the essential. Marcella Quinchavil Stéen is a Swedish-Chilean dance artist. Her artistic practice is inspired of somatic practices, everyday habits and how words construct situations. Her performative interest lies in the banal, what knowledge is and both the vulnerable and the ridiculous in being a human. That, in order to have a critical perspective on feelings, performance and power structures. She graduated from Trinity Laban Conservatoire of Music and Dance with a first class degree BA (Hons) in Contemporary Dance, London, U.K. Currently, she is undertaking a MFA in Performing Arts. She has worked with very famous people, and is very famous herself. Observe the empty space between inhaling and exhaling. Trap into the silence between the words. Things disappear, only the last substance remains. Forms disappear, only the formless remains. Definitions disappear, the undefined remains. But this very pure space is there before anything comes into being. Hannes Buder (born 1978 in the former GDR) is a musician, improviser and composer in the field of experimental music. His works concentrate on issues of movement, authenticity, intuition, minimalism, density and slowness. Buder's current projects include the bands 'Zug Zug' with Todd Capp and Andrew Lafkas, 'Gravity' with Hannes Lingens and Andrew Lafkas, the duo with Luc Houtkamp, the dance company "one:third", and his solo project. Beyond that he has collaborated with Audrey Chen, Tony Buck, Audrey Lauro, Hilary Jeffery, Mike Majkowski, Matthias Bauer, Steve Heather, the Berlin Improvisers Orchestra and many others. Hannes Buder's Solo recordings include "changes" (2000), "dunkelbunt" (2004), "openyoureyescloseyoureyes" (2006) and "changes II" (2015). He performed concerts in Europe, Australia and in the USA. Buder has also composed, improvised and recorded music for different dance (Oxana Chi, Judith Sanchez Ruìz), theater (Jörg Mihan, Johannes Maria Schmit) and film projects (Barbara Lubich, Annick Gaudreault). He's been giving workshops at festivals, music schools and with prisoners in jail. He studied guitar at the Carl Maria von Weber Conservatory in Dresden and the Franz Liszt Conservatory in Weimar. Sarah Jegelka is a professional dancer based in Berlin. Sarah likes to find new ways of connecting and expressing different arts through movement. Fascinated by the notion of touching the unconscious inherent in movement, she has chosen to further her research in the area of instant composition and mind-body connection, studying western and eastern medicine and philosophies. Is Berlin's winter slowly creeping into your flesh and bones? PAUL is here for you! We invite you to a guided session of one-on-one bodywork. Let's bring a little cosiness into the dark, cold winter season! In this workshop we will explore different bodywork techniques with a partner. Together we will become versed in new possibilities in 'Hands on' work and, best of all, enjoy a relaxing treatment from our partners! You don't have to register with a partner! The Holidays are almost here and we’re ready to take some time off! PAUL Studios will be CLOSED from Dec. 21st-Jan. 3rd! Wishing you all a happy holiday season! We are looking forward to our fifth volume of The Wall Series at PAUL Studios Berlin! This bi-monthly performance series gives artists an opportunity to present their works in progress or finished works in an intimate setting for an enthusiastic audience. For Vol. 5, we are looking for artists who would like to present their work on Friday, January 18th 2019. We are open to performers of all disciplines interested in sharing their pieces in an intimate venue. All performers will receive 5 hours of free rehearsal time at PAUL Studios Berlin prior to the performance. The Deadline For Submissions Is: Friday, December 21st 2018! THANK YOU FOR JOINING US FOR THE WALL SERIES VOL. 4! We want to give a BIG thanks to our amazing artists of Vol. 4 for sharing their works with us. Thank you Brad Nath, Josephine Affray, Giorgia Reitani, Francesca Merolla, Camille Chapon, Masha Fomenko, and Petr Laden! We also want to thank the talented filmmaker Enzo Mosconi for documenting this magical evening! Keep your eyes open for Enzos documentary on the Berlin Art scene, which will include this months performances! Last but not least, Thank you to the outstanding audiences who joined us for The Wall Series Vol. 4! There would be no performance without all of you. We hope to see you next time! Once again we were overwhelmed and overjoyed with the amount of talented artists who sent us applications to perform at PAUL. In our fourth edition we are proud to present the works of five outstanding artists. This bi-monthly performance series invites performers of all disciplines and in all stages of their work to perform amidst our new WALL. We are so lucky to have these artists in our presence. Don't miss this inspiring evening! Bricks cast with embedded audio electronics allow the ubiquitous building modules to function as sound objects when amplified. The performance will feature a selection of bricks from a system that is being developed to construct full-scale sonically sensitive architectural environments. Made from a range of materials—concrete, plaster, wax, and silicone—each brick expresses its unique sonic ontology when activated by a performer or stacked upon another, resulting in physical feedback. 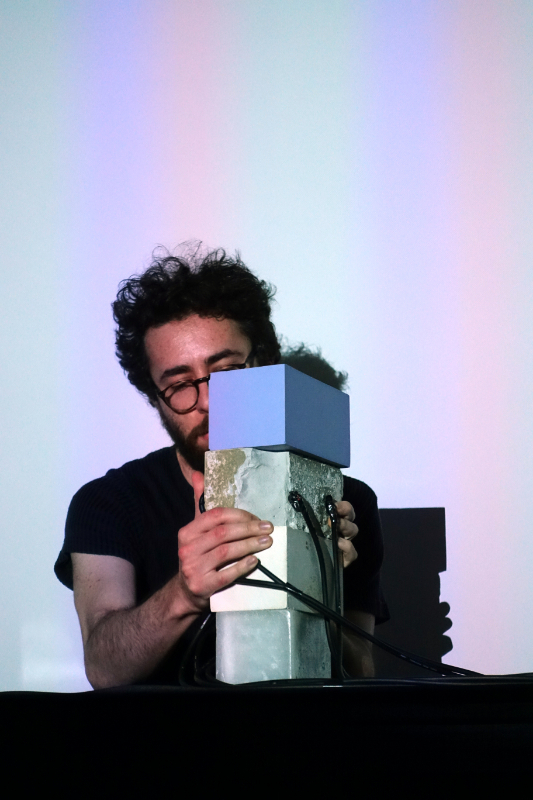 Brad Nath is working between architectural design and sound art to develop techniques of space-making which are sensitive to the vibrations that occur at audible frequencies. Emerging from the belief that the architect is not only an organizer of space, but also of time, and that likewise the composer is not only an organizer of time, but also of space, he seeks to expand upon the built environment's temporal vocabulary through material research, performance, composition, installation, and built environments. Brad recently moved to Berlin from New York, where he completed a B.Arch thesis titled "Acoustectonics" with advisers from the Architecture and Music Departments at Cornell University. MIMOWERK is a journey through multiple personas drawing a self-portrait. Always having had an obsessive pleasure in dressing up and acting out as different characters while being in my own environment: my room, I decided to use it as a starting point for research. My room felt like an experimental laboratory far from any fears. Perhaps I had spatial restrictions but certainly no boundaries when it came to dare to push unknown doors. My main tool of work was my video camera, I could analyse my self-image and behaviours by watching the videos made during my journey into defining my different personas. Punk culture has been essential throughout the process as it helped my awakening of my inside scream: ANGER. MIMOWERK is an inside scream loudly extracted to the outside, a confrontation, a manifestation, a denunciation, a call. Joséphine Auffray studied at Trinity Laban Conservatoire of Music and Dance in London (2015-2018) for the BA (Hons) in Contemporary Dance. In 2017, as part of the Erasmus programme, Joséphine studied at Folkwang Universität der Künste in Essen for several months. During her training, Joséphine has been performing works by Merce Cunningham, Alison Curtis Jones, Marina Collard, Heidi Rustgaard, Claude Brumachon and Benjamin Lamarche. Throughout this period, she has been able to experience collaborations with artists such as Ellen Van Schuylenburch, John Richards and Rodolfo Araya. By studing at Laban School, Joséphine achieved and collected choreographic tools, which pushed her to create already two of her own works; KLIMAX and MIMOWERK. Originally from France, Joséphine first studied in the Conservatoire de Nantes with intense ballet training along teachers such as Nathalie Quernet, Maurice Courchay and Marie-Elisabeth Demaille. Deeply attracted to contemporary values, she then followed in the same Conservatoire the contemporary dance Course along teachers such as Rodolfo Araya, Rosine Nadjard and Anne Carrié. ‘Chopsticks’ is born from a collaboration between the two Italian dancers Francesca Merolla and Giorgia Reitani and the Vietnamese choreographer Khai Ngoc Vu, during the year 2017-2018 in which they worked at the Tanzcompagnie Volkstheatre Rostock. The duet, 15 minutes long, uses movements to voice a desire of union. What does it mean to have a tradition in our society that perpetually forces us to move and start from zero somewhere else? How can we feel at home when the circumstances are hostile and hard? With this tumultuous lifestyle, Where/How do we find peace? Perhaps in the reminiscing of our culture, far away as it may be. Perhaps in a common fight. Or maybe we attempt to conjure up something completely new to draw us back towards that innocent and overflowing state of serenity and play that we experienced so strongly before we got conscious, growing more ravenous and blinded by every failed attempt. Our journey does not really give an answer but it can give us some calmness in the experience of union, collaboration and honesty with the other. When we put our hearts together as part of a unique body, the struggle is easier and the journey morphs into a pleasant succession of moments of freedom and belonging. Between 2013-2016 Italian-born Giorgia Reitani studied at Iwanson International. After the education she worked for Hannes Härtl in the production ‘Bloodlines’, in Munich, Germany. Then she worked for two years at the Tanzcompagnie Volstheater Rostock, being part of different productions of Katja Taranu and the show ’The four seasons’ choreographed from Elias Lazaridis. She is dancing in the piece choreographed by Khai Ngoc Vu “Chopsticks” with Francesca Merolla. In 2016, after her graduation at the Iwanson International, she started her apprenticeship at the ZfinMalta Dance Ensemble. She was then part of the Tanzcompagnie Volstheater Rostock, performing ‘The four seasons’ choreographed by Elias Lazaridis. She worked for Iván Pérez in the production ‘Island’ in Wrocalw, Poland and she is currently part of B’cause Dance Company in Warsaw. She is dancing in the piece choreographed by Khai Ngoc Vu “Chopsticks” with Giorgia Reitani. Fictive magicians. Dragon Ball Z. Fantastic animals. When a child plays, he is sometimes taken by the desire of creating the sound effects of his own actions. And as he navigates blithely in his imaginary world that protects him from the gaze of others, the sounds naturally come out of his mouth. I play with reminiscences of that state to create a language for improvisation, this time fully exposed. Camille Chapon / Jofe D'mahl, Artist based in Berlin. Director and Host of the Cabaret for arts and mixed performances called "Carte Blanche". Member of a performance trio called "Eternuer", together with Bruno Ducret and Tom Bouët. Invested in pedagogy, teaching improvisation workshop for children and adults. 2014, Master of Fine Art, Ecole supérieure d’art et de design – ESAD-GV, France. 2017, Bachelor dance context and choreography, Hzt Berlin, Germany. Great Circus of Failure combines approaches of contemporary music and dance, performance arts, new media art and reworks them in new circumstances. There are two main points for acting: enjoyment of art, equal to enjoyment of life, and the idea of personal memory, keeping unstable (quantum) state of the happening. Great Circus of Failure was formed in spring 2018 by Petr Laden and Masha Fomenko. Masha has background in the field of game development and theory of interaction of computer gaming with spatial performative practices. Petr worked as video and performance artist and curator. If you need to contact us for rentals, classes, workshops or any other questions, you can now reach us at: +49 151 541 70245 between the hours of 10:00-18:00. Thank you! 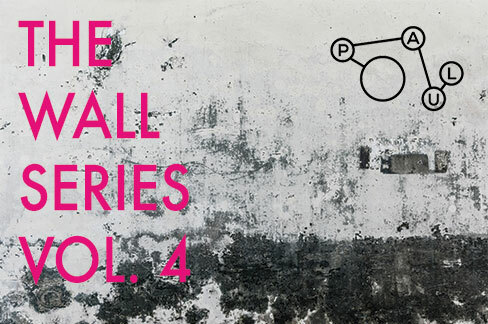 We are looking forward to our fourth volume of The Wall Series at PAUL Studios Berlin! This bi-monthly performance series gives artists an opportunity to present their works in progress or finished works in an intimate setting for an enthusiastic audience. For Vol. 4, we are looking for artists who would like to present their work on Friday, November 23rd. We are open to performers of all disciplines interested in sharing their pieces in an intimate venue. All performers will receive 5 hours of free rehearsal time at PAUL Studios Berlin prior to the performance. THANK YOU FOR JOINING US FOR ‘DUST’! A huge thank you to our artists in residence Erika Mitsubishi & Francesca Frewer for their inspiring work, and their magical transformation of our space. We are looking forward to seeing ‘Dust’ continue to grow in the months that follow. Wishing you both the best and safe travels. Thank you for bringing your work to PAUL! THANK YOU FOR JOINING US FOR THE WALL SERIES VOL. 3! Another eclectic, inspiring evening of movement at PAUL. Thank you to our amazing performers Lola Lefèvre, Kazuma Motomura, Rina Idota, Darragh Mcloughlin, Siri Salminen & Erik Wong! A big thank you to all who came to enjoy the show, we hope to see you again soon! 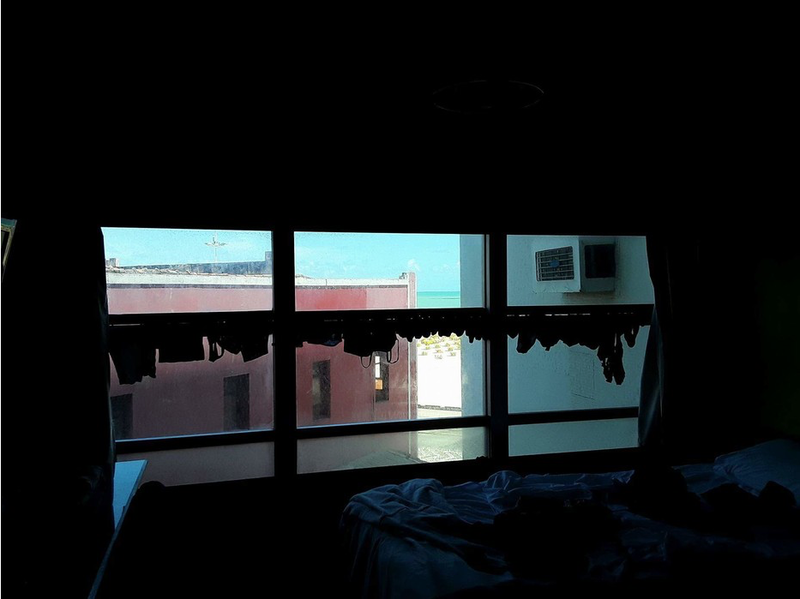 Visiting artists in residence Francesca Frewer and Erika Mitsuhashi will share their work in progress 'DUST' on Thursday, September 20th at 19:00 @ PAUL Studios. Join us in viewing the culmination of a two week residency at PAUL! 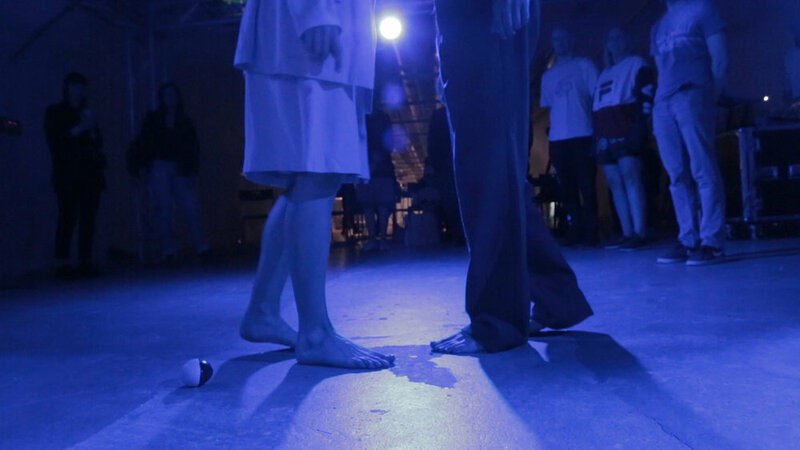 Dust is a contemporary performance piece created by Erika Mitsuhashi and Francesca Frewer, and performed by Francesca Frewer. Inspired by poet Anne Carson’s study of female characters who refuse to fit into straightforward understandings of how they should be, with this piece they are exploring ways of embodying the uncanny, with the aim of manifesting the bizarre and unsettling onstage. Using choreographed movement, improvisation, text, and projection, the solo takes place inside a complex set constructed of dynamic and sometimes precarious materials. It is created in collaboration with Adam Asnan (sound) and Nellie Gossen (costume/set design). 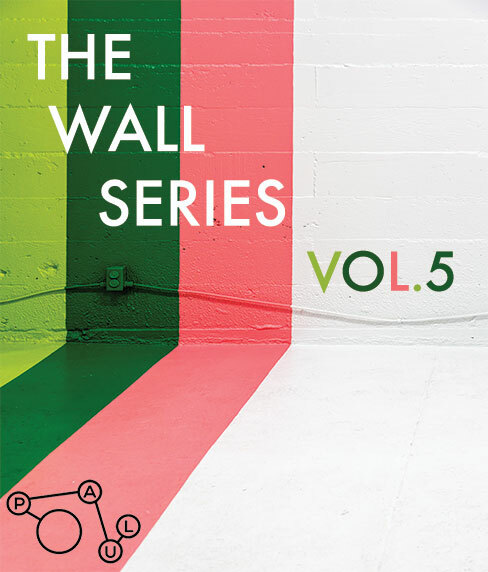 JOIN US FOR OUR THIRD VOLUME OF THE WALL SERIES! Tickets are 8-10 Euro Sliding Scale at the Door! Edouard, Macha, Nicolae, Joseph, Dillia, Valodia, Patrick, Alejandra, Denis, Lucie, Pierre, Davie, Piotr, Niolae, Cristian, Maria, Danielle, Josiane, Vasiliev, Olivier, Rolf, Jean Marc, Patricia, Marcel - Vibrating link in between us and the world, all these names resonate in me since the first moment I saw their faces. Sensible place where I allow myself to fall into, “Resonances” is a moment of sharing. A place where I allow myself to be fully vulnerable, a place where I can be. Call for light. For you Nicolae, and all the others. Lola Lefèvre is a French dancer and performer. After a high level training in Rhythmic gymnastic, she decided to turn to contemporary dance by passing her Choreographic Diploma in the CRR of Boulogne Billancourt (France), before joining in 2014, the professional school of contemporary dance SEAD in Salzburg (Austria). Under a very poetic artistic line, she combines dance and performance with romanticism, and is particularly interested in interdisciplinary collaboration. Boom Boom! Is a direct reaction of body to the music. Which music? A complex super layered glitchy multi rhythm machine gun composed by musician and beat maker Zozo. How much of the beats and accents can the body catch, all the while reacting to audience and the space around the dancing body? Which body? 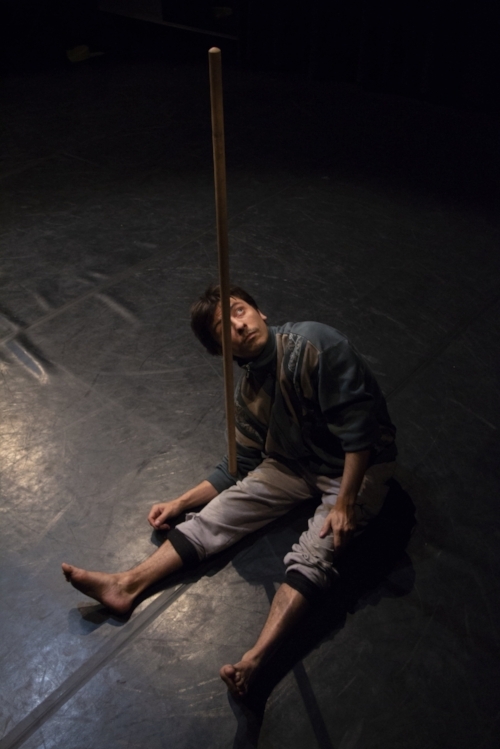 Dance and performance maker Kazuma Glen Motomura tackles the music head on with his body physically composed of memories of dancing around the universe. Half Japanese, half South African. Dances a melange of contemporary and street/club styles. Finalist of Juste Debout 2018 World Championship battles in street dance and winner in the Experimental division in London. Stickman works extensively with the concept of (re)framing: periodically shifting the conceptual /emotional setting of the work on order to continuously challenge the audiences interpretation of the piece. This is achieved primarily through use of linguistic framing, whereby a TV displays titles /sentences which dramatically shift the focus of what we see age experience. Stickman is more about the the moment of interpretation than what is being interpreted. The main content of the work is the result of two years of investigation into object balancing. Balance as a means to force the body into a perpetual state of motion. The body responds out of pure necessity, and through this begins to speak. Darragh was born in Ireland in 1987, son to two chefs. He has a degree in contemporary circus and performance at, yet these days is happy to just call himself a creator and performer without sticking to one genre or another. He is the artistic director of Squarehead Productions, and is currently based in Berlin. Stickman is his 3rd full length creation. The duo investigate and try to captivate moments with the guitar, movement, and percussive footwork in the manner of improvisation. Delicate and glittery yet with a touch of explosion and punk. The scrap is rolling in the wind. Born 1981 in Minneapolis, grew up in Hong Kong, studied psychology at the University of Minnesota, and subsequently audio production and engineering at the Institute of Production and Recording. 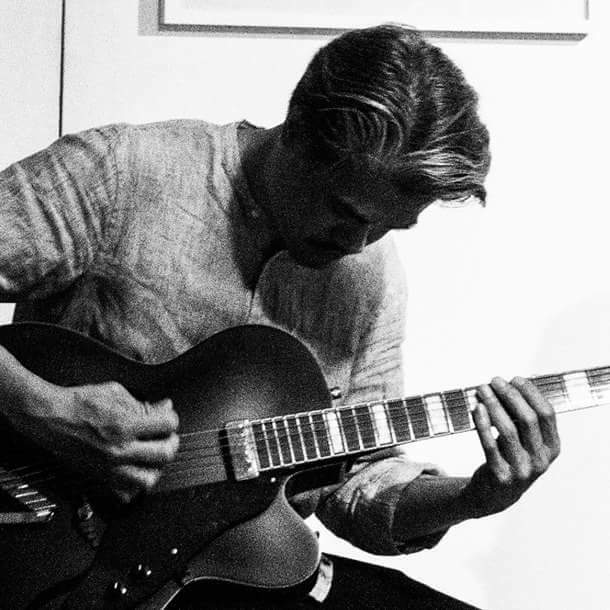 He is a composer and sound artist, as well as a guitarist and computer musician. His main focus lies on sound textures, the perception of sound and spatial experience. Born in 1987 in Stockholm. Graduated from the University College of Dance and Circus in Stockholm 2011 with specialisation in flamenco dance, and has since then worked with contemporary flamenco and dance pedagogics in different contexts, mostly in Sweden and Turkey and now also Germany. Her main interest lies in different aspects of absurdity and uningratiating qualities. We are looking forward to our third volume of The Wall Series at PAUL Studios Berlin! Our first two installments were filled with moving works and enthusiastic audiences, and we can’t wait to see what Vol. 3 brings! For Vol. 3, we are looking for artists who would like to present their work on Friday, September 14th. We are open to performers of all disciplines interested in sharing their pieces in an intimate venue. All performers will receive 5 hours of free rehearsal time at PAUL Studios Berlin prior to the performance. In What We Could Possibly Finish Together, we visit a space inhabited by four people exploring everyday life. Situations and actions become stuck in loops, while synchronicities build a harmonic togetherness and a total incomprehension. Four people search for spontaneity as a base for an undisguised dialogue, search for playfulness as a livable concept to commit to a transparent togetherness. THANK YOU FOR COMING TO THE WALL SERIES VOL.2! Our second installment of The Wall Series was such a success! We had an amazing audience, and four unforgettable performances. Thank you to all who came out to experience the show, and of course, thank you to our amazing Artists Nicola Bullock, Manon Siv, Eri Watanabe, and the participants of Alberto Cortes' workshop. If you missed this months performance, don't worry there will be more where that came from. Join our mailing list to be the first to know about our next installment of our new bimonthly performance The Wall Series! JOIN US FOR OUR SECOND VOLUME OF THE WALL SERIES! We were overwhelmed and overjoyed with the amount of talented artists with interest in performing at PAUL. In this edition we are proud to present the works of three outstanding artists: Nikola Bullock, Manon Sif, & Eri Watanabe. This bi-monthly performance series invites performers of all disciplines and in all stages of their work to perform amidst our new WALL. All proceeds of The Wall Series will go towards covering the costs of the new wall which makes this performance series possible! We are so lucky to have these artists in our presence. Don't miss this delightful evening! Donations: 5-10euro (Sliding Scale) at the door - Please reserve a spot on our Eventbrite Link! *TICKETS*: We had such a huge turnout at our last show that not all attendees were able to see the show! This time, we ask you to kindly reserve a spot by clicking on our EVENTBRITE link. This way we won't sell out, and know how many guests to expect. THANK YOU! What happens when dreams and reality collide? In "soft fists insist", a woman is confronted with popular images and ideas about how she-young, white, and female- should behave in the world. As she grapples to interpret these ideations, she begins to lose track of her deeper needs and fears. A piece about the space between what we are and what we imagine ourselves to be, "soft fists insist" asks the question, how does the unconscious relate to social constructions such as femininity, aging, and desire? High-five to the ridiculous effort to escape oneself. A tribute to the impossibility to comprehend. Anyways, the right circumstances will never be there. Hope for their contributions, the black sheep illuminations. A sensorization of belonging to. An ode to the miseries, talents & imaginations of all those little fires unexpected. I describe of my feelings, when I expression to something that I use to my body. My feelings is always not fixed, like a wave and electrocardiogram. My image flow into the outside.